A wonderfully flavored European version of the American French Fry. 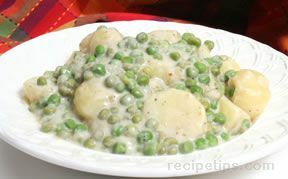 With a mandoline or vegetable peeler, cut strips of unpeeled potato about 3-4 inches long and 1/2-inch to 1-inch wide. 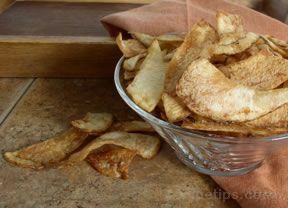 Immediately immerse the strips into a bowl of cold water until ready to fry. Heat about 1 1/2 inches of oil in a large heavy saucepan. Oil is ready when it reaches a temperature of 375° F.
Drain strips of potatoes thoroughly and dry with a paper towel to remove any additional moisture. 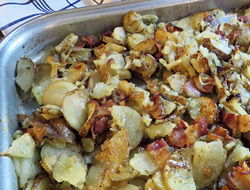 Fry potatoes in small batches for approximately 5 minutes or until they begin to turn brown. Remove from oil, drain on paper towel, season to taste and allow to cool. 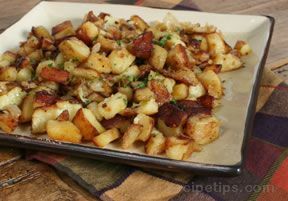 Once the potatoes have cooled, fry them once again in small batches for 1 to 2 minutes or until they become crisp and brown. Remove and drain on a paper towel. Lightly salt if desired, and serve immediately.